Here's my Star-traxx recorded RAT ride progress. If look look close enough, you'll see "homeplate" shaped markers. Those represent my position when the GPS transponder uplinks each hour. The program then plays connect the dots. The connect the dots are not an accurate representation of my route. I think the next time I use Star-Traxx to establish my route I'll choose to uplink more often - maybe each half hour. 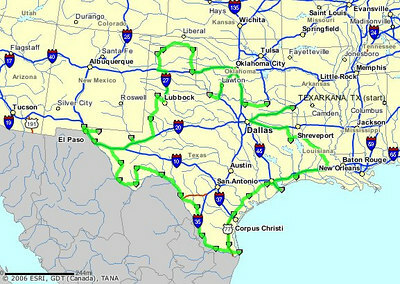 My actual route stayed in Texas the entire time and I never went to Dallas (?) or New Orleans (?). Hey nothings perfect - right? !